EDICIÓN ORIGINAL: Justice League núms. 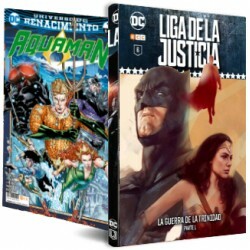 6 a 10 USA ¡Incluye el cómic promocional Batman: Renacimiento! Tienes más detalles sobre esta colección en este enlace. GUIÓN: Geoff Johns DIBUJO: Carlos D'Anda, Gene Ha, Ivan Reis, Jim Lee FORMATO: Cartoné, 120 págs. A color. EDICIÓN ORIGINAL: Justice League núms. 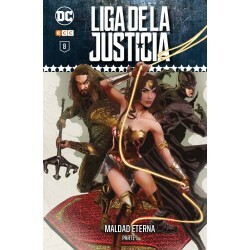 11 a 14 USA, Justice League núm. 0 USA (extracto), Secret Origins núm. 1 USA (Superman) ¡Incluye el cómic promocional Superman: Renacimiento! Tienes más detalles sobre esta colección en este enlace. 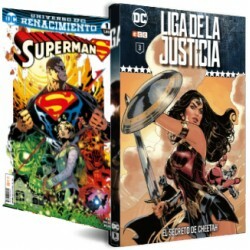 GUIÓN: Geoff Johns, Greg Pak DIBUJO: Gary Frank, Jim Lee, Lee Weeks, Tony S. Daniel FORMATO: Cartoné, 120 págs. A color. EDICIÓN ORIGINAL: Justice League núms. 15 a 16 USA, Aquaman núms. 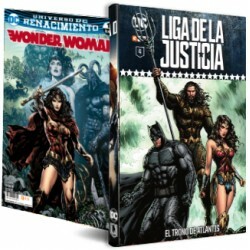 14 a 16 USA ¡Incluye el cómic promocional Wonder Woman: Renacimiento! Tienes más detalles sobre esta colección en este enlace. GUIÓN: Geoff Johns DIBUJO: Ivan Reis, Paul Pelletier, Pere Pérez, Pete Woods FORMATO:Cartoné, 120 págs. A color. EDICIÓN ORIGINAL: Justice League núms. 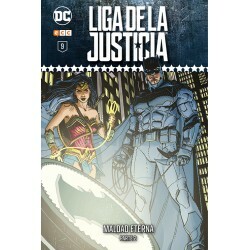 17 a 20 USA, DC Comics - The New 52 FCBD Special Edition USA GUIÓN: Geoff Johns, Ray Fawkes DIBUJO: Andrés Guinaldo, Daniel Sampere, Dustin Nguyen, Gene Ha, Ivan Reis, Jim Lee, Joe Prado, Kenneth Rocafort, Rob Hunter, Vicente Cifuentes FORMATO: Cartoné, 120 págs. A color. 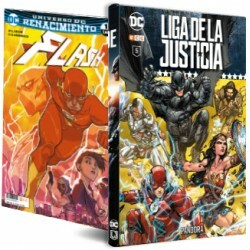 EDICIÓN ORIGINAL: Justice League núm. 23 USA, Justice League núm. 23. 4 USA, Forever Evil núms. 1 a 2 USA GUIÓN: Geoff Johns, Sterling Gates DIBUJO: David Finch, Ivan Reis, Joe Prado, Szymon Kudranski FORMATO: Cartoné, 120 págs. A color. EDICIÓN ORIGINAL: Forever Evil núms. 2 a 3 USA, Justice League núms. 24 a 25 USA, Secret Origins núm. 6 USA (Wonder Woman) GUIÓN: Brian Azzarello, Cliff Chiang, Geoff Johns DIBUJO: David Finch, Doug Mahnke, Goran Sudžuka, Ivan Reis FORMATO: Cartoné, 120 págs. A color. EDICIÓN ORIGINAL: Justice League núms. 26 a 28 USA, Forever Evil núms. 4 a 5 USA GUIÓN: Geoff Johns DIBUJO: David Finch, Doug Mahnke, Ivan Reis FORMATO: Cartoné, 120 págs. A color. EDICIÓN ORIGINAL: Forever Evil núms. 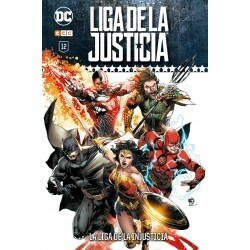 6 a 7 USA, Justice League núm. 29 USA, Secret Origins núm. 2 USA (Aquaman), Secret Origin núm. 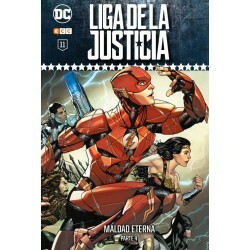 7 USA (Flash) GUIÓN: Geoff Johns, Jeff Parker, Robert Venditti DIBUJO: Doug Mahnke, Ivan Reis, Miguel Sepúlveda, Paul Pelletier, Van Jensen FORMATO: Cartoné, 120 págs. A color. EDICIÓN ORIGINAL: Justice League núms. 30 a 33 USA, Secret Origin núm. 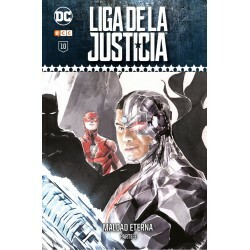 5 USA (Cíborg) GUIÓN: Geoff Johns, Marv Wolfman DIBUJO: Doug Mahnke, Edgar Salazar, Ivan Reis FORMATO: Cartoné, 120 págs. A color.